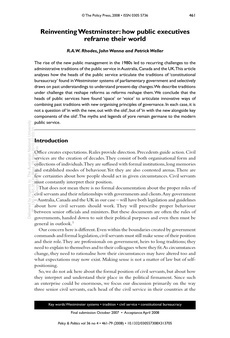 The rise of the new public management in the 1980s led to recurring challenges to the administrative traditions of the public service in Australia, Canada and the UK. This article analyses how the heads of the public service articulate the traditions of 'constitutional bureaucracy' found in Westminster systems of parliamentary government and selectively draws on past understandings to understand present-day changes. We describe traditions under challenge that reshape reforms as reforms reshape them. We conclude that the heads of public services have found 'space' or 'voice' to articulate innovative ways of combining past traditions with new organising principles of governance. In each case, it is not a question of 'in with the new, out with the old', but of 'in with the new alongside key components of the old'. The myths and legends of yore remain germane to the modern public service.